In a loch the size of Loch Ness, you will expect a wide of variety of objects to be lying at the bottom of its dark, murky depths. We have mentioned a panoply of such things over the lifetime of this blog and they include John Cobb's speedboat, various ships, a Viking longship, a Wellington Bomber, a monster prop, the body of Winifred Hambro, fridges, cars, myriad pieces of Nessie hunting equipment, steam tractors from the time of the 1930s road expansion and, of course, a number of Nessie carcasses. Perhaps you can add your own object to this Loch Ness junkyard. Now I find another object named in the Aberdeen Press and Journal, dated 13th December 1950. This goes back to July 1544 and I reproduce the article below. In hindsight, the story was already in my copy of George Campbell's "The First and Lost Iona". The bell was taken from the ruined priory at Cille-Chumein (the town's name before it was renamed Fort Augustus after the Battle of Culloden). The intention was to rehouse it in the Lovat's church in Glen Covinth near Beauly. Campbell's books relates how the bell was "sacrificed" as an offering to the spirit of the lake, which I would take to be the Loch Ness Each Uisge. Now, the location of the holy bell is unknown and yet we are told the loch waters above it have healing powers. You just need to know where! The reference to Aneurin Bevan brings us down to earth as he was the then architect of the National Health Service (another religion of the British people). However, Campbell speculates from the Wardlaw Manuscript in suggesting the bell may have been deposited at or near Ellanwirrich or Cherry Island as it is now called. But, using my previously calculated silt deposition rate of 4mm per annum suggests the bell is now under a metre of silt. One would presume that, if it exists at all, it is not going to be found anytime soon. Is the Loch Ness Monster a Sturgeon? That was about six months since the Aldie Mackay report in the Inverness Courier. The leading expert at the time, Rupert T. Gould, in his 1934 book, "The Loch Ness Monster and Others", examined the various theories to explain the reports that had been coming from the loch since the year before and addressed the sturgeon idea which he said was "in some ways ... rather attractive". His drawing below drew out some ideas. 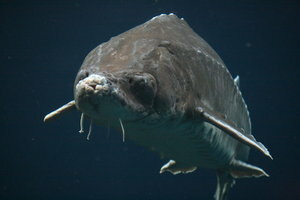 The first being that the sturgeon's snout could, in theory, be mistaken for a long neck. Likewise, the bony plates along its back may be misinterpreted as a line of humps. In that light he considered it a theory worthy of examination. However, serious objections were finally raised by Gould. Firstly, that the claimed size of the Loch Ness Monster was up to three times longer than the biggest sturgeon known. Secondly, the bony plates may be construed as humps, but their rather fixed configuration does not allow for the rather more pronounced double humps and so on, let alone the classic upturned boat scenario. However, Gould eventually went with his itinerant sea serpent idea and any thought of a sturgeon finding its way into Loch Ness largely fell by the wayside as more exotic theories won the day. "I think it could be the occasional navigationally challenged Atlantic Sturgeon," he says, with a mischievous smile. Known to grow to over 4m long, the fish, which has reptilian scaled plates along its back and a long pointed face with tusk-like barbells hanging from its jaws, is not indigenous to Scotland. It could conceivably make its way up River Ness and into the loch in the search for new breeding grounds. "It could very easily have swum into the loch, been spotted and left again leaving nothing behind save an enigma," he says. Adrian's thinking on this certainly goes as far back as Operation Deepscan in 1987 where he mentioned the possibility. However, it was the publication of a paper in 1993 for The Scottish Naturalist that caught the attention of the press and went worldwide. This clipping from the Times Daily of the 30th December 1993 sums it up. Note that even in the less consumer strained times of the 19th century, this creature was regarded as a rare visitor to the more accessible waterways. The near 11 foot specimen mentioned above weighed in at over two hundredweight which equates to over 16 stones or 100 kilos. Quite a beast in its own right, though a bit worrying for this theory that I could not find more modern stories. Having said all that, I have yet to find a newspaper article from any year talking about a sturgeon being caught in Loch Ness. That does not mean that such an event has never happened, but the clippings above suggest that such an event would undoubtedly receive local newspaper coverage (angling was a big sport in the Highlands with newspaper carrying frequent reports on angling news). The thing about this theory is that it is a bit player. It is not a theory crafted to explain many sightings, for in the world of scepticism, the monster is a motley mosaic of so called ordinary objects seen in so called extraordinary circumstances. My opinion is that such extraordinary circumstances are rare to the vanishing point. The sturgeon is offered as an almost monstrous monster to explain accounts which go beyond the simplistic boat wake or floating log. But the problems with this idea of an itinerant sturgeon are greater than that for an exotic monster. I heard of an old Chinese proverb asking what is the most cunning animal. The answer is the one that is yet to be found. Whilst the disputed behavioural characteristics of the Loch Ness Monster allows it fulfil that age old puzzle, the same cannot be said of a sturgeon. The point being that no sturgeon has been caught, let alone a verifiable photograph or video clip of one. You can take that thought two ways. It can either mean that this proves no sturgeon has ever entered Loch Ness or it means that large water breathing creatures can enter the loch and remain largely undetected. The counter argument on that point is that the sturgeon is an in-out creature. Adrian's comment above that the said sturgeon would ultimately leave the loch seems an unlikely proposition for this type of creature. However, if a sturgeon did enter the loch and inevitably become loch bound, it again says rather a lot for the general monster hunt paradigm that even this type of well known creature cannot be detected in Loch Ness. In November 1933 Lt.-Commander R.T. Gould (1934: 30) listened to the account of Mr. John McLeod, who, some 20-30 years previously had seen, at the mouth of the River Moriston beneath the lowest fall, a creature with a "head like an eel and a long tapering tail". This is how a Sturgeon might appear from above. Another witness, Miss K. MacDonald, spoke of a "crocodile"-like creature, 6-8 feet long, ascending the River Ness and heading for the Holm Mills weir, in February 1932 (Gould, 1943: 38). Rather more recently, in 1993, Mrs Marion MacDonald described to the author an experience at the Fort Augustus Abbey harbour. She saw what she first thought was a log, because of a distinctive 'scaly' bark pattern, but which then developed a wake and moved off to submerge, while she called her family. After she had sketched her impression (Figure 2, 8K) she was shown an illustration of a Sturgeon's bony plates, and considered the pattern to be reminiscent of what she had seen. Three eyewitness reports are brought forward in support of the sturgeon theory. What struck me was how these sightings were not consigned to the usual sceptic dustbin of more mundane explanations. After all, we are repeatedly told that eyewitnesses practically forget all the important details by the next day, the newspapers exaggerate stories or it is just the locals having a laugh. Yet, here, suddenly, the clouds of poor memory depart. The perception of the eyewitnesses becomes lucid and their descriptions are as sharp as a tack. The 1993 report would have normally been written of as a log. John MacLeod's sighting would have been told he saw a seal and Miss MacDonald's encounter was not even in Loch Ness! Here we have an example of sceptics having their cake and eating it. Sightings are anecdotal garbage ... unless they are useful in promoting your cause. Try and tell me this is consistent and unbiased critical thinking! It would be remiss of me not to mention the saga of Adrian Shine's pet sturgeon at this juncture. It transpired back in 2000 that Adrian was rearing his own sturgeon in a pond at the Loch Ness Centre in Drumnadrochit. It seems it had grown to six feet long and Adrian was a bit peeved it's existence had been revealed as he was conducting experiments as to how visitors described it when it surfaced. Other Loch Ness researchers were a little less sympathetic when they wondered what would have happened to the fish when it got too big. Would it be secretly dumped in the loch, caught and then declared to be Nessie? Conspiracy theories aside, what exactly was Adrian trying to achieve as viewing a sturgeon at a few feet away hardly constitutes a sighting reproduction. One also wonders what the endgame for the sturgeon really was? Fish and chips or fish and ships? That a sturgeon may or may not have entered Loch Ness is not the point of the debate. They may have, but given the recent sceptical disdain for dolphins getting into Loch Ness, I doubt they could be of the opposite mind with sturgeons. Rather, such a creature is not a good fit for what is described and is actually just a debating tool to lift the sceptical debate above the banality of waves and birds. Indeed, sceptics admit such a creature would only explain a small percentage of sightings. The situation is best summed up in the cartoon I saw recently which shows a dinosaur like Nessie snacking on a tiny sturgeon, to which eyewitnesses holler "WOW! There really IS a sturgeon in Loch Ness!". In other words, there are bigger fish to fry in Loch Ness.